A genus which is represented in a number of states, Olearia are a group of small shrubs with some large species. Often referred to as the ‘Daisy Bush’ they are in fact related to the Asteraceae family and have daisy like flowers. Foliage differs from species to species, some with spikey upright foliage others with a more prostrate growth habit. These are a group of evergreen plants growing to between 1 -5m. Found in many areas some species make wonderful plants for coastal areas. All species require a well drained soil and most grow best in full sun. A few named cultivars have been released in recent years, many with tighter and bushier growth habits than the species. Olearia teretifolia is one species used in landscaping. 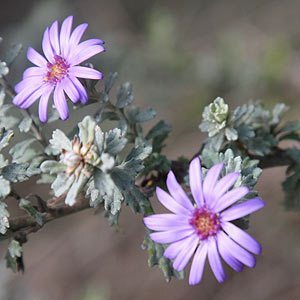 also known as the ‘Cypress Daisy Bush’ this is an upright species, good green foliage and covered in masses of small white flowers from summer through to autumn. A very different species is Olearia traversiorum, this one is known as the Chatham Island Daisy Tree, fast growing and with yellow flowers. It is wonderful in coastal conditions and could be used instead of Olive trees in some landscaping schemes. Most species produce masses of flowers and will benefit from light pruning after flowering to promote a more bushy habit. Pictured is Olearia astroloba or the ‘Marble Daisy Bush’. A small shrub to between 1 and 2 m in height. Attractive mauve flowers, rarely offered for sale. Olearia axillaris is referred to as the ‘Coastal Daisy Bush’, native to Western Australia where it grows in sandy coastal soils. Requires similar conditions to thrive. Olearia phlogopappa is the’ Dusky Daisy Bush’, deep pink flowers and on of the more widely used species in landscaping. Generally reaching around 1m in height. Olearia lirata or ‘Snowy Daisy Bush’ which will grow to 5m. Larger lanceolate foliage and creamy white flowers. This species grows in the rainforest areas of Eastern Victoria, Southern New south Wales and Tasmania. It requires a deeper moist soil, will grow in dappled shade, although still requiring good drainage.